What happened to Locke during his life and what were some of his important publications? John Locke was born in Wrington, Somerset, England. His father was an attorney and justice of the peace who fought on the Parliamentary side against Charles I. At Westminster school, which Locke began attending in 1646, he learned the classics, Hebrew, and Arabic. From Westminster, he went to Oxford University, where he disagreed with the scholastic philosophy that was taught. After he achieved his master’s degree, he lectured in Latin and Greek, and in 1664 he was given the position of Censor of Moral Philosophy. When his father died in 1661, Locke inherited enough money to be financially independent. He soon met such famed scientists as Robert Boyle, Isaac Newton, and renowned physician Thomas Sydenham, who inspired Locke to train as a medical doctor. Locke never practiced medicine but was considered knowledgeable in this area all his life. Locke also served Shaftesbury in practical political ways that resulted in some of his most important contributions. He drafted a constitution for British colonial Carolina and was secretary to the Council of Trade and Plantations. Shaftesbury was tried for treason due to his leadership of the Parliamentary opposition to the Stuarts. He was acquitted, but left England for Holland. Locke also left, and while he was in Holland, his position at Oxford was taken away by the king; then James II denounced him as a traitor after the Duke of Monmouth’s failed rebellion. Locke continued to write, working on An Essay Concerning Human Understanding (1689) and his First Letter Concerning Toleration (1689). He also became involved with the plan to put the Protestants William and Mary on the English throne. Locke advised William, and after the Glorious Rebellion of 1688, he escorted Mary, Princess of Orange, on her ship back to England. In 1689 and 1690, Locke’s two major works An Essay Concerning Human Understanding and Two Treatises of Civil Government were completed. Always suffering from poor health, Locke then retired from his active involvements in politics. Still, he went on to write Some Thoughts Concerning Education (1693) and The Reasonableness of Christianity, (1695), followed by A Vindication of the Reasonableness of Christianity (1695). This last work sparked a controversy between Locke and Edward Stillingfleet, bishop of Worcester. Locke’s denial of evidence for substance was taken by Stillingfleet to be a denial of the Anglican Church’s doctrine of the Trinity, as well as a barrier to life after death through the immortality of the soul. 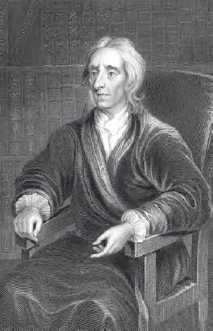 John Locke’s political views greatly influenced the democratization of the British government and the fundamental ideals of the U.S. Constitution (iStock).